Few business men of Angola are better known or more respected, by the citizens of Steuben County, than the subject of this sketch. 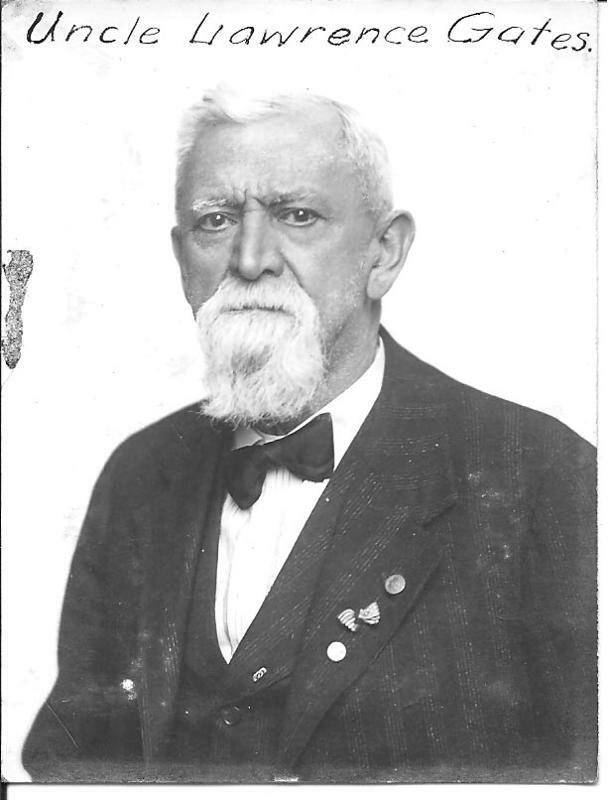 He was born in Nuremburg, Germany, April 25, 1839, and was the son of Christopher and Sibilla Gates, natives of Germany. He received a good education, and in 1853, he came, with his maternal grandfather, to the United states, and settled in Angola, arriving May 2, of that year. Since his coming, he has been engaged in farming and merchandising until February 6, 1871, when he entered the banking institution of Kinney and Co., where he is at present engaged. On August 9, 1862, he left Angola with Company H, which he helped to organize, and of which he was elected First Lieutenant. This company became a part of the Seventy-fourth Indiana volunteer Infantry. After the battle of Chickamauga, he became Captain of the company, and his regiment being a part of the Fourteenth Army Corps, he participated in all its engagements until September 15, 1864, when he lost his left leg in a railroad accident at Allatoona, Ga., on account of which he resigned May 18, 1865. He was married, June 4, 1865 to Martha E. Sowle, daughter of A.W.A. Sowle, of Angola. Mrs. Gates was born in New York, and had one child by her marriage-- Roy Gates, who died in infancy. Immediately after his marriage, he and wife went on a visit to his native land, returning in two months. Mrs. Gates died in Angola March 14, 1868, and he was again married March 28, 1869, to Tina M. Elya, of Angola, to whom has been born three children--Milla A., Fred C. and Harry L.
Mr. Gates is a member of I.O.O.F., of which he has held one of the Grand Offices; is also a member of the Knights of Honor, and has always been a stanch Republican in politics. He was the first Clerk of Angola, and has been Town Trustee five years. He and wife belong to the Disciples Church, of which they are consistent members. Mr. Gates, although coming to this county a poor German boy, has by energy, honesty and a firm determination to succeed in life, won a leading position among the best business men of Angola. Thomas Morgan, Charles B. Mann, William B. Jacobs. Ohio, and joined in pursuit of Bragg. on Nov. 17 were exchanged. creek and numerous minor engagements about Atlanta. Carolinas to Raleigh, thence to Washington City. 1,157. Loss by death, 260; desertion, 25, unaccounted for, 4. Report of Lieut. Col. Myron Baker, Seventy-fourth Indiana Infantry. road leading to Ringgold. The regiment was on the march all night. front line, the Tenth Indiana being on its immediate left. At about 10 a. m.
volley from the Fourth Kentucky, Tenth Indiana, and Seventy-fourth Indiana. ground and the density of the thick woods through which the battle raged. officers died the same day, having discharged their duties faithfully and well. J. North, Capt. Everett F. Abbott, Capt. Joel F. Kinney, First Lieut. Ananias Davis, First Lieut. David P. Deardoff, Second Lieut. the deployment was finished 1 man from Company C was wounded. enemy was thrown into confusion and driven back from before our position. behind the breastworks, from which Hazen's brigade had been withdrawn. was in rear of all the infantry, except the Tenth and Seventy-fourth Indiana. followed by the Tenth Indiana. injured on this day, and no enlisted man was killed. equally deserving and meritorious might be injured. Lieut. Col., Comdg. Seventy-fourth Regt. Indiana Infty. Acting Assistant Adjutant-Gen., Second Brigade. Fought on 14 Sep 1862 at Munfordville, KY. Fought on 4 Feb 1863 at Munfordville, KY. Fought on 23 Feb 1863. Fought on 14 Jun 1864 at Kenesaw Mountain, GA. Fought on 6 Aug 1864 at Atlanta, GA. Fought on 12 Aug 1864 at Atlanta, GA. Fought on 18 Aug 1864 at Atlanta, GA. Fought on 20 Aug 1864 at Atlanta, GA. Fought on 20 Sep 1864. Fought on 20 Oct 1864 at Calhoun, GA. Fought on 8 Nov 1864 at Kingston, GA.
Service Record: Commissioned an officer in Company H, Indiana 74th Infantry Regiment on 20 Aug 1862. Promoted to Full Captain on 08 Oct 1863. Mustered out on 18 May 1865.